We’ve somehow made to the end of 3rd Quarter, tracking every dollar we’ve spent this year (scroll to the bottom of the post for the total numbers)! September was another expensive month, mostly because our weekend at the Imogene Pass Run cost us more than booking our holiday trip to Switzerland did (as icing on the cake, the race was also much more difficult than visiting Switzerland is expected to be). The main cost during the race weekend was a fancy private vacation rental near the finish line that we paid for by check, and our travel hacking hobby didn’t help us out much on that one. Race registration costs were included in June spending. Still, we had an absolute blast at the race and the costs of training and the race weekend itself were more than worth it (read our “Tips for Endurance Racing as a Busy Parent” here). Later in the month, my brother got married in the Valley of Fire in Nevada, and we celebrated afterward at the Cosmopolitan on the Vegas strip. This trip, fortunately, was largely covered by hotel points. If you’re interested, check out our spending reports for January, February, March, April, May, June, July and August. June’s report contains totals for the half-year mark as well. -This list does not include at-home babysitters, who we very occasionally pay in cash to watch our kids when Grandma isn’t available (Grandmas are the best!!!). Any at-home babysitters we pay are non-essential, although very much appreciated. The daycare/childcare shown is what we pay for while we are both at work (which is very much essential as long as we both want to work) and is listed under “Daycare/Childcare”. If we had not done the IPR race, which was just a six-hour drive and two nights in an expensive town (the largest single expense this month aside from our mortgage), that total would have been well below $5,700. Our total spending for the first 3 quarters of 2018 is $55,047.20, for a family of 4 in a high COL location. This assumes we can count the initial costs of buying our house (down payment, closing costs, etc.) as either an investment or a savings account (we lean toward the latter, although we have no beef with anyone who wants to call their primary home an investment). 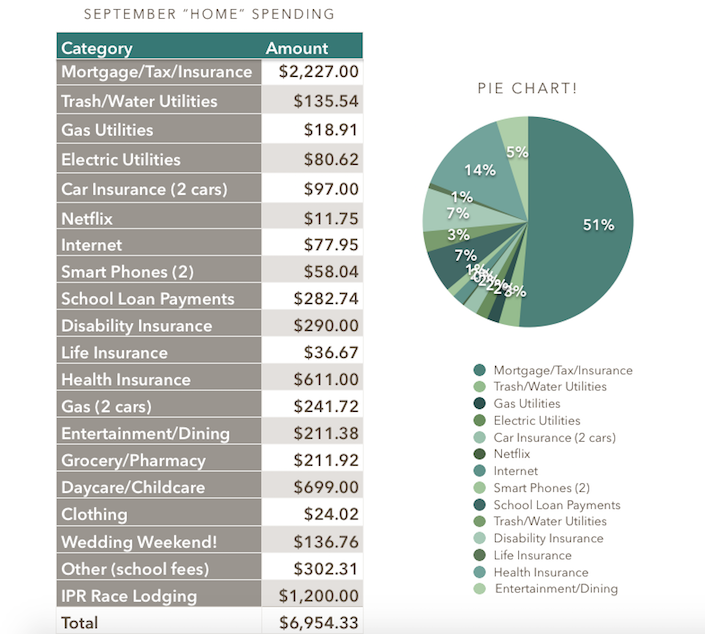 Please also note that even though our mortgage is a HUGE percentage of our spending this month – and most months for the foreseeable future, actually – it is far less than that if looked at as a percentage of our income. I would not recommend anyone spend close to half of their net income on a mortgage, ever. If you’re not in a position to take on a mortgage, remember that there is nothing wrong with renting or having roommates! Also note that the student loans are still on track to be paid off in December! Whoooohooooo! I’m really working on keeping track of the complete details of my spending, including all receipts. Maybe I’ll be better after my nursing training is done. Thanks for the inspiration!